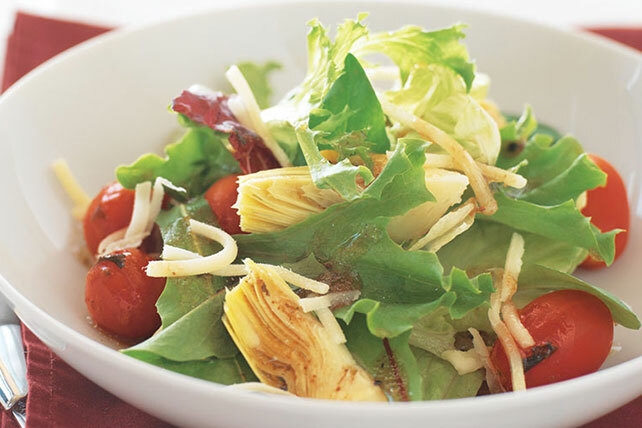 Use this layering technique to make a big salad a whole day ahead of time! The greens will stay crisp and delicious right until you're ready to serve. Layer all ingredients except dressing in large clear bowl in the order listed. Cover surface with damp paper towels, then cover bowl with plastic wrap. Refrigerate several hours or overnight. Toss with dressing just before serving. Add some of your favorite salad ingredients, such as thinly sliced red onions, sliced black olives or red and green pepper strips.